2.Size: 2.16" x 1.37" x 0.78". 3.Battery: CR2032 button batteries (included). 5.Lights colors: Purple, green, orange, blue and white. 6.Funtion: Flash products, to wear your pet around the neck, to protect pets at night flashing safety. 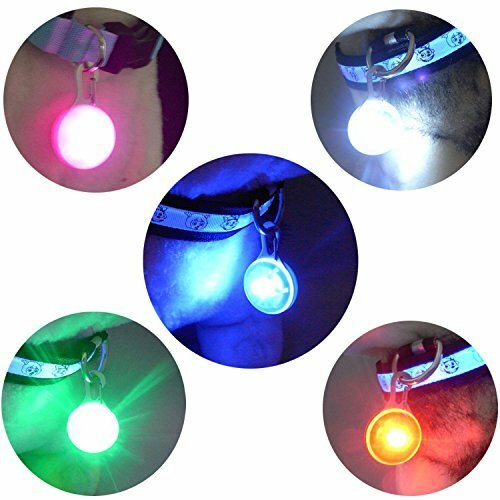 VARIOUS COLORS - Dog collar blinker lights comes with five colors, orange, green, white, blue, purple. COMPACT AND EFFECTIVE - easy to use as a clip on light for a dog collar charm, dog collar light, gear or apparel light, or keychain light. MULTI-USE - Clip the lightweight, durable Safe Light to your pet's collar, or use as a Carabiner, Keychain, locate tent lines and camping gear. The battery-powered LED emits a bright ambient glow, perfect for those pre-dawn or after dark outdoor. SECURITY AND STABILITY -Secure stainless steel spring clip to easily attach to your dog's collar, quick and easy bright, perfect for when your pet is playing out in the dark. If you have any questions about this product by Carlie, contact us by completing and submitting the form below. If you are looking for a specif part number, please include it with your message.